Cottages C/o Brick Kilns Barney Ltd01328 878305work01328 878948fax Self-cateringBrick Kilns Barney Ltd has 4 self-catering holiday cottages situated in a quiet, rural location, 8 miles from the North Norfolk coast (Blakeney); Kiln Barn sleeps 2, Stable & Stiffkey Barns sleep 6 and Wensum Barn sleeps 4. Stable, Stiffkey and Wensum can also be booked as a group to sleep 16 – all under one roof! The company also has B&B accommodation available at the same location. All cottages are tastefully furnished with good-sized sitting/dining room and kitchen areas. The kitchens are all fully-equipped, bed-linen and towels are provided and there are clothes washing/drying facilities available for each. The cottages have both double and twin rooms (some with en-suite), with fully-tiled shower/bathrooms, offering very comfortable and attractive surroundings to enjoy special time with family or friends. All properties are on one-floor. Close-by, there is fishing, a children’s play area and shop available to purchase everyday items and there is a bar & restaurant (open 4 nights a week) within walking distance. Fabulous dog-walks available from the site too! Barney is centrally located in Norfolk, providing the perfect base to discover all that Norfolk has to offer, from fabulous beaches, National Trust properties, the Broads National Park, pretty market towns and the city of Norwich. Brick Kilns Barney Ltd has 4 self-catering holiday cottages situated in a quiet, rural location, 8 miles from the North Norfolk coast (Blakeney); Kiln Barn sleeps 2, Stable & Stiffkey Barns sleep 6 and Wensum Barn sleeps 4. 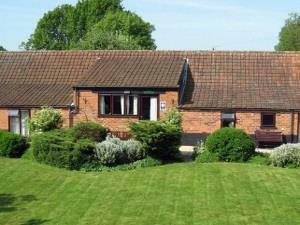 Stable, Stiffkey and Wensum can also be booked as a group to sleep 16 – all under one roof! The company also has B&B accommodation available at the same location. Fishing and children’s play areas are within a five-minute walk. Dog walk maps also available on request. Children welcome from any age. From Fakenham follow A148 Cromer road for 7 miles. Turn right at Thursford onto B1354 signposted Melton Constable. Turn right after 200yds signposted Barney, turn left after 500yds into Little Barney Lane. The Paddocks is on the right after 0.75 miles. From Norwich is 28 miles.